The COPS clean sweep in the U13 800m race courtesy of Connor Walker (gold), James Rothwell (silver) and George Whiteman (bronze). The swimmers of City of Peterborough Swimming Club (COPs) gave up the relative comfort of indoor swimming at the regional pool to take part in the joing East Region and Cambridgeshire COUNTy ASA Open Water Championships. Open water events require specialist facilities and trained officials so the event held at Whitlingham Country Park near Norwich served not only as the regional and county championships, but also as the qualifying event for this year’s National Open Water Championships. COPs champions Ella Mcghie and Connor Walker. So when the mud had finally settled back into the reed beds, the 13 COPs swimmers who took part could reflect on a job well done with a total of two gold and two silver East region medals, six gold, four silver and one bronze Cambridgeshire county medals and five swimmers qualifying for the National Open Water Championships. Eighteen years old Aisling Ruff has been the doyen of open water swimming at COPs as, for several years she was the only entrant from Peterborough at these competitions. In the 5km event Aisling showed her experience by coming from back in the pack at the start of the last lap to take both championship gold medals with a time of 1:03.40 which qualifies her for the National Open Water championships. Joshua Graves (19) took 5th place in the men’s 5km East Region championships, but his finishing time of 1:02.44 gave him the Cambridgeshire County gold medal and a place at the National Championships. Harry Whiteman (16) had started the medal haul for COPs in the 3km event as he too qualified for the National championships by taking the gold medal in both championships with a time of 39:48.5. In the 1500m event Matthew Rothwell was the fastest 14 year old, but his finish time of 19:48.7 missed winning a regional medal by an agonising 2.5 seconds. It did however secure the county silver medal and another of COPs qualification times for the National championships. Matthew Wouldham (15) was placed 28th in the 1500m event. 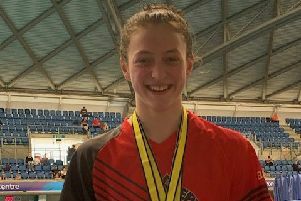 Jade Goode (13) was seventh in the East Region 1500m event, but took gold in the county event with her time of 20:38.23 and she secured Cops fifth qualification for the national championships. Also swimming in the 1500m event was Mackenzie Whyatt (14) who finished in a time of 20:58.97 to take the Cambridgeshire County silver medal. In the men’s 800m Novice event Connor Walker (12) took the East Region silver medal in a time of 11:34 and he lead a county championship’s 1-2-3 for COPs as James Rothwell (12) and George Whiteman (12) filled the podium taking the silver and bronze medals for Cops alongside Connor. In the women’s 800m novice event 12 year-old Ella Mcghie took the East Region and Cambridgeshire County Championship silver medals with her time of 12:16.61 while Lilly Borgognoni (13) took the Cambridgeshire county gold medal in a time of 14:38.98 and Rhiannon Loutit (15) did the same in her age group with a finishing time of 13:01.04. COPs Head coach Ben Negus said we haven’t focussed on open water until this year although we have previously had some success with Aisling Ruff and Nathan Tweedie. This year we have identified swimmers we thought could excel at open water and trained at Tallington lakes and these results are a just reward for that preparation.